Whenever we study or talk about radioactivity, the name Henri Becquerel at once enters our minds. He was the discoverer of radioactivity, for which he was awarded the 1903 Nobel Prize, sharing the award with Pierre and Marie Curie. 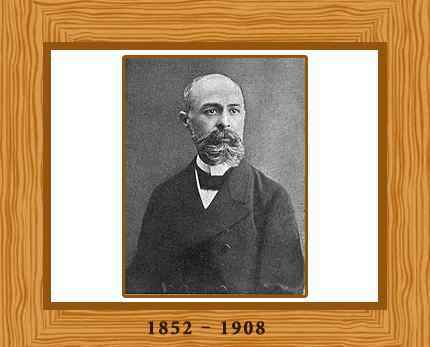 Antoine Henri Becquerel was born in Paris on December 15, 1852, a member of a distinguished family of scholars and scientists. His father, Alexander Edmond Becquerel, was a professor of applied physics at École Polytechnique in Paris and had researched solar radiation and phosphorescence. Antoine entered the École Polytechnique in 1872 and ultimately became a professor of applied physics in the institute. Initially after obtaining his degree, Becquerel trained to be an engineer. He took a position as engineer in the Department of Bridges and Highways and worked his way up becoming chief engineer in 1894. In addition to his engineering work, he continued his education and study for a doctorate degree. The early research of Becquerel was almost entirely in optics. His first extensive investigations dealt with the rotation of plane-polarized light by magnetic fields. He next turned to infra-red spectra, making visual observations by means of the light released from certain phosphorescent crystals under infra-red illumination. He then studied the absorption of light in crystals. With these studies, Becquerel obtained his doctorate from the Faculty of Sciences of Paris in 1888, aged 36 and was elected to the Academy of Sciences in 1889. Becquerel married Louise Désirée Lorieux in 1890 and they has a son Jean, who also became a physicist. In 1892, he was appointed professor of applied physics in the Department of Natural History at the Paris Museum. At the age of forty three, Becquerel accepted a teaching position at the École Polytechnique. Becquerel decided to investigate whether there was any connection between X-rays and naturally occurring phosphorescence. The glow of X-ray emission put Becquerel in mind of the light in his doctorate study although he had not done as much active research in the last few years. He had inherited from his father a supply of uranium salts, which displayed phosphoresce when exposed to light. When the salts were placed near to a photographic plate covered with opaque paper, the plate was discovered to be fogged. The phenomenon was found to be common to all the uranium salts studied and it was concluded to be a property of the uranium atom. Finally Becquerel showed that the rays emitted by uranium caused gases to ionize and that they differed from X-rays in that they could be deflected by electric or magnetic fields. In this way his spontaneous discovery of radioactivity occurred. Nowadays it is generally considered that Becquerel discovered radioactivity by serendipity. It is also known that Becquerel discovered one type of radioactivity, beta particles, which are high-speed electrons leaving the nucleus of the atom. He demonstrated in 1899 that beta particles were the same as the recently identified electron. From handling radioactive stones he noted that he developed recurring burns on his skin, which led ultimately to the use of radioactivity in medicine. Besides being a Nobel Laureate, Becquerel was elected a member of the Academe des Sciences de France and succeeded Berthelot as Life Secretary of that body. He was a member also of the Accademia dei Lincei and of the Royal Academy of Berlin, amongst others. He was also made an Officer of the Legion of Honor. Becquerel published his findings in many papers, principally in the Annales de Physique et de Chimie and the Comptes Rendus de l’Academie des Sciences. The famous scientist died on August 25 in 1908 at Le Croisic in Brittany, France.